Jen had her wisdom teeth out last Friday, same as I did three years ago. Three whole years since I graduated from high school. I am so old. I looked back on my blog to see what I posted about having my teeth out, and I must have deleted that post because I didn't find anything. I should probably delete more of those old posts. Some of them are so silly. My memories of the wisdom tooth experience are fading; I do know I got them out on a Friday morning; came home, watched a movie, took a nap, got up and ate ice cream and was fine. I don't remember any extreme discomfort, I didn't take any painkillers, and I went to Church on Sunday in good health. Jen's experience was not so rosy. She, too, had hers out on Friday morning. We stocked up on ice cream, pudding, soft fruit, etc. The one thing that made me mad when I had my teeth pulled was Mom(albeit accidentally) bought ice cream with almonds in it- very frustrating to eat. 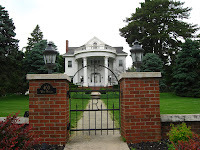 We were all hushed and excited when Jen finally got home, wanting to know how it went. She laid down on the couch and was a zombie for three whole days- swollen, not speaking, no facial expression, hardly any eating. Nothing. She was just starting to get better yesterday. And she had to use painkillers. Have I just forgotten how bad it was, or did I have it easy? The one thing that did plague me for more than six months afterward was tightness in my jaw and pain when I ate popcorn. And I love popcorn, so that was an affliction. 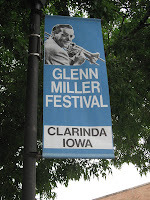 I had the privilege this past weekend to visit Clarinda, IA, for the annual Glenn Miller festival. An elderly lady asked me to take her(she was tired of bus trips) and so I had basically no expenses. The price I had to pay was to listen to the lady talk talk talk for two whole days... See, I'm still being sanctified. I enjoy Glenn Miller music, too. I got to go to three concerts- the Glenn Miller Orchestra, Glenn Miller "Live" from Cafe Rouge, where they reproduced a Miller TV show, and the 312 Army Reserve Band. That SPC Reynolds is the Army version of Michael Bluble- He was great! 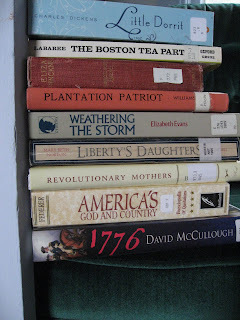 I am trying to read up on women of the Revolutionary War; unfortunately most books on that topic are incredibly feministic in style and therefore demeaning to the women they are addressing. I'm forging ahead though, and slowly making progress. Met an overly friendly male "tour guide"(???) on my last day(sob sob, session is over) at Capitol. I tried to politely not answer his questions about where I live.... always after one of these weird conversations I wonder if I should have been more reserved, and if I said to much. Went to a family reunion, which I hate to say wasn't much fun, and on the way home we were stopped by a man in the middle of the road waving his arms. A young man driving a van that wasn't his, with no driver's license, no insurance, no registration, no money, no food, no one to call for help, and nowhere to go. In the end we had to just leave him at an all-night gas station. Then when we were almost home late at night, we barely missed hitting a deer. Finished sewing projects for Jen's ballet recital, which is on Thursday. Panic! Had my teeth cleaned, no cavities, Yay! So there you have it. My life is currently consumed with Recital details and plans for the next month, since I am organizing a mini Tea party(Taxed Enough Already) for July 4th and our cousins are coming for two weeks at the end of June. Oh, we also have two birthdays, a Swedish festival, and a trip to Clarinda, IA in the next week. So many details!